Market Buster Review - Scam or Legit? Market Buster is a binary trading software that’s gaining momentum recently, along with few other similar programs. The way Market Buster works is not that different from others we have reviewed before, but the question remains – is Market Buster a scam? Market Buster has one of the more professional-looking homepage, as far as binary trading softwares are concerned. 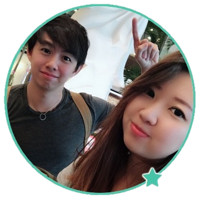 Like many other “get-rich-quick” programs, Market Buster wastes no time and makes a bold claim straight away – Ready to make $2,000 a day? Well, the answer is a resounding YES, naturally. But can Market Buster deliver what it claims? The video on the home page of Market Buster doesn’t provide much useful information, apart from feeding you with a lot of empty hypes and false claims. 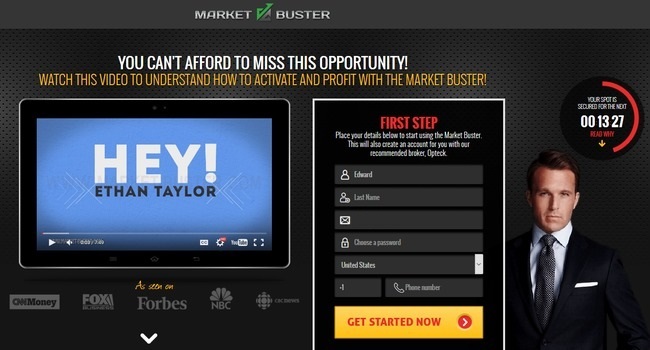 It claims that you have received a personal invitation to try out Market Buster system, and you don’t have to pay anything to use the software during your 6 months trial. After 6 months, if you have earned enough (or lost it all, which they have conveniently left out), you can choose not to use Market Buster anymore. However, according to them, you won’t stop using it because you’ll be “so stuffed with money”. During the course of the entire video, Market Buster did not reveal the risks of using a binary trading software, much less how risky binary options is as a trading instrument. Before we proceed further, we want to make sure everyone knows what binary trading is, and why you shouldn’t bet your financial future on it. Let alone a piece of software that claims to make you rich. Binary options is one of the simplest forms of trading. You don’t have to analyze the news or read the charts. All you have to do is to guess YES or NO in each of your trade. Note that I used the word “guess”. Every trade lasts a short amount of time, usually between 30 seconds to minutes. Before each trade, you guess if the price will rise or fall after a set amount of time, for example 1 minute. Let’s say I guess that the price of an asset will rise 1 minute later, and I bet $50 on it. If the price is indeed higher after a minute, and I am correct, I get to win a certain percentage of the money I bet earlier, say 80%. I win $40 in this case. What if the price falls and I’m wrong? I lose the $50 I “invest”. See the imbalance of winning vs losing payout in binary options? Even if I manage to get it right 50% of the time, I’ll still lose money. And how do I know if the price will rise or fall 1 minute from the time I bet? I don’t. Remember, the market fluctuation in such a short amount of time is IRRATIONAL. No one can get it right consistently, and definitely not a piece of software. Now that you know how binary options work, let’s take a look at what Market Buster claims they can do for you. Market Buster promises you a handsome profit of $2,000 every single day, but they neglected to disclose any of the risks related to trading with binary options within their sales material. According to Market Buster, the way it works is very simple. You just choose how much money you like to invest, and how many times you like Market Buster to trade for you. The software will take care of everything for you and earn you profits every single day. It’s THAT simple. 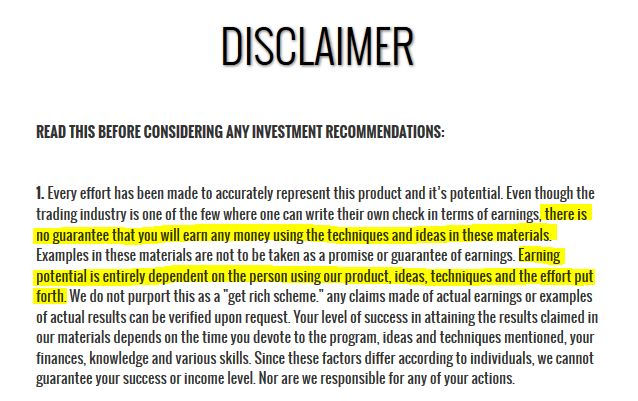 However, if you take a close look at their link to disclaimer, which is hidden away as a fine print at the bottom of the page, you’ll realize that Market Buster makes no claim of guaranteed income, despite what they claim in the sales material. Instead, earning potential is entirely dependent on the skills of the person using Market Buster, including techniques and effort you put forth in order to earn money. What happened to auto trading and the simple maneuver of Market Buster software? This is not what Market Buster promised us in their sales pages! 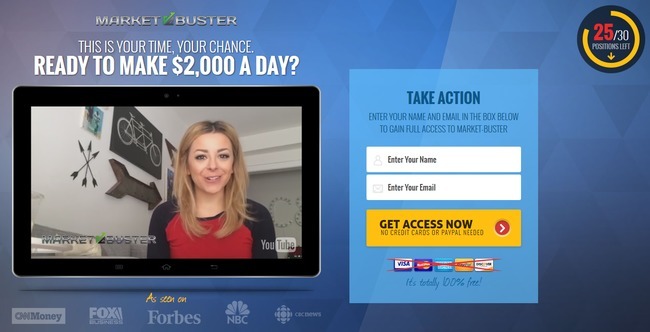 Despite the claims of earning $2,000 a day, you should not view Market Buster as a “get rich scheme” according to them. Maybe we should see it as a “get poor scheme”, since you are more than likely to lose all your investments away. Before you can activate Market Buster, you need to sign up for an account with their designated broker, in this case Opteck binary options broker. Reviewing Opteck is out of the scope of this article, so we will just focus on Market Buster instead. Keep in mind that you can use the Market Buster software ONLY if you sign up for an account through them with Opteck. You cannot use the software with any other broker as well. This is because the team behind Market Buster earns a referral fee when you use their affiliate link to sign up with Opteck, and place a minimum deposit. Not only that, there are other ways Market Buster can earn commissions off you. Every time you place a trade with Opteck, Market Buster will earn some commissions from you. Remember that you have to automate your trades with Market Buster system? This means that your trading frequency is decided by Market Buster as well. In short, other than earning a commission when you open an account with their affiliated broker, Market Buster can also determine how much commission to earn from you as long as you still have money in your trading account – whether you win or lose the trades. Should I Try Market Buster? As we’ve said in the review earlier, we don’t recommend binary options as a way to make money online. It’s not that different from gambling, and using an automated trading software doesn’t make it better. You are essentially putting your hopes and your entire investment in a piece of software that gambles on your behalf.